Human emotions are sometimes best personified by non-human stand-ins, especially when they are dark or too challenging. This is not a new phenomenon. Native Americans imbued animal spirits with human motivations. Children often use dolls to express their innermost feelings. C. S. Lewis wrote of “Daemons”; animal companions who reflected the inner conscience and spirit of the human character. 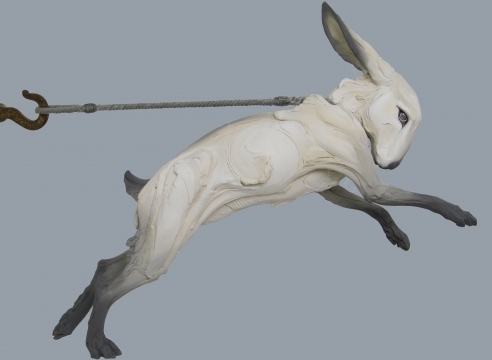 Beth Cavener’s haunting work, now viewable in a handsomely installed exhibition at Jason Jacques Gallery in New York, confronts viewers with raw human emotions personified by animals. They include sexual identity, co-dependence, and feelings of entrapment.